The Account Center and the UO Store will be taken down for maintenance on Thursday, January 31st. This will take approx 5 hours and should be back up and functional by noon on the 31st. Thank you for your patience and understanding ! Please take note of the following important dates as they relate to the Publish 104 Castle contest. In case you haven’t read the latest newsletter, we want to share with you the first release of our upcoming roadmap for 2019! This year is going to be packed full of adventure! Since its release in 2010, High Seas has been one of the most commonly talked about additions to Ultima Online. It comes up at meet and greets, the various player gatherings we’ve had over the years, the forums, and in feedback we receive directly. We are excited to announce the theme for 2019 will be focusing on the High Seas! So what does that mean for publishes this year? Is every publish going to be about sailing the oceans, fishing, and pirate hunting? Not exactly – but close! Our goal is to continue to support the events and systems you have come to love while revamping the areas of the High Seas that need it most. In each publish we will be tackling a major High Seas content area and combining it with often requested new features, content, quality of life updates, client updates, tools, and bug fixes. The first Publish of 2019 is Publish 104 – Rising Tide. Rising Tide will introduce new veteran rewards, a new way to identify hues in the classic client, client performance and accessibility updates, Parry balance changes, quality of life updates to cannons, and more! The High Seas are vast and t’will be a long voyage ahead! 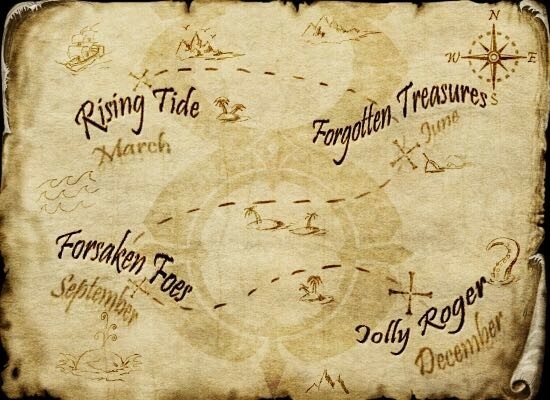 Join us as we look forward to a year of swashbuckling adventure at every turn! March will bring Rising Tide, updating the cannon crafting, ammunition, and firing process! As we sail into the Summer June brings Forgotten Treasures where we will focus on updates to treasure chests on both land and sea! Coasting into Fall we find ourselves confronting Forsaken Foes – a new take on Corgul & Charybdis! Wading into Winter look high for Jolly Roger bringing both cheer and dread to the oceans far! This is only a small portion of what 2019 brings and we look forward to sharing more details as the year sails on! We are pleased to release the final installment in the puzzling series of stories on the mysterious origins of Krampus, The Blind Beggar’s Friend. We are pleased to release the next installment in the puzzling series of stories on the mysterious origins of Krampus, The Farmer’s Goat. Please join us for our final Meet & Greet of 2018! Join us on Baja on Monday, December 10, 2018 at 9pm ET at King Blackthorn’s Castle. Have you ever wanted to enjoy afternoon tea while dressed like an orc? Do you absolutely need to role play a talking dragon for your guild’s holiday pageant while still maintaining your combat readiness – well now you can! Combine costumes with this totem to free up your precious equipment slots to stay combat ready and look great while doing it! 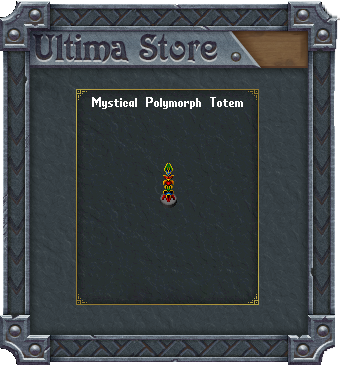 Get yours in the Ultima Store today! December to Dismember Ultima Store Sale! We are pleased to announce select items in the Ultima Store are on sale for the month of December! 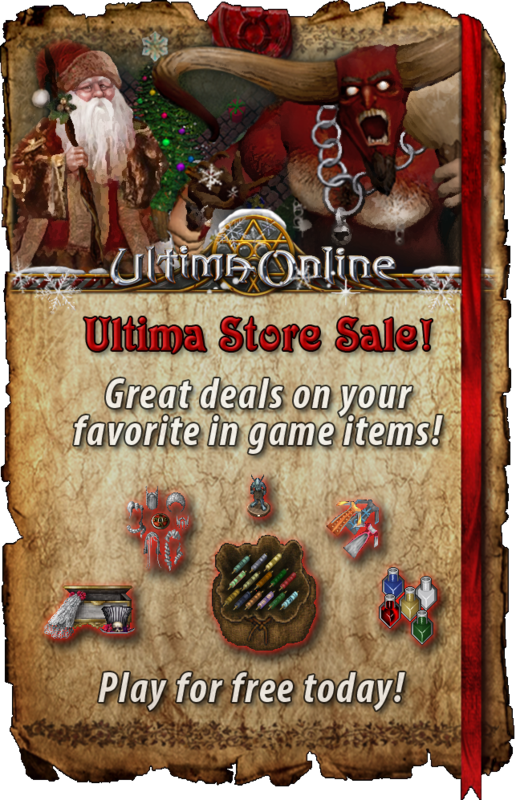 Visit the Ultima Store today to take advantage of this limited time event! Enjoy great savings on some of your favorite items such as Hairstyle Change Tokens, Natural Hair Dyes, Pigments of Tokuno and much, much more!